I had big plans for July 3rd. My agenda has the day blocked out with big letters: U2. 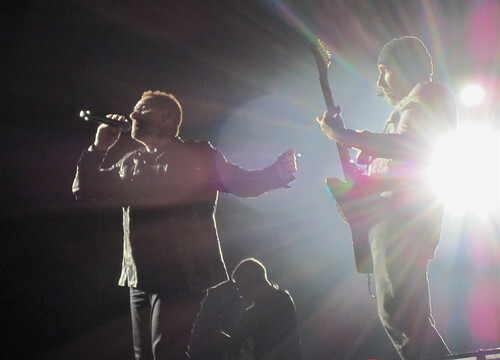 Today would have been my ninth U2 show and the fourth within less than a year. When I scored my set of floor tickets last October, I looked forward to spending a summer's day in the line-up outside the stadium. Depending who got the other three tickets, maybe I'd even set up camp in the wee hours of the morning since July 3rd falls on a long weekend. No need to use a vacation day and a whole day of recovery time! But, this weekend won't play out like that since our hero Bono has suffered a major medical set-back. All the North American shows are postponed with no dates rescheduled yet. Jokes aside about Bono carrying the weight of the world on his back, the cancellation of the tour leg is a very big deal for the one million ticket holders who made plans, booking flights or hotels, for the roadies and crews and venue workers and for countless other people. It's crazy when you think about it: so much disruption all relating to one man's spine. I don't mind too much that the show has been put off for an uncertain number of months. I feel as though little time has passed since 2009's U2 Week. On the occasion of the canceled concert, I present to you my ideal concert set-list. For performances, U2 can select from a 20 year catalogue of passionate rock anthems plus 10 years of less memorable adult contemporary tunes. I'm a very loyal woman so I will follow U2 no matter what, but you'll note most of the songs I've picked are pre-2000. Okay, after going through song lists and YouTube footage, I'm now kinda sad not to have a concert soon. Fellow U2 fans, what's on your ideal set list? Love the setlist! Its even better than the real thing. Personally, I would add in God's country, and Walk On. Oh, Anisa. I forgot about "Walk On". That was one of the big tear-jerking moments of 360. Yes, let's include that, perhaps as the second encore in lieu of 'With Or Without You" (although Ewan will be disappointed). this is the shortlist but Zooropa has to be first. My ideal (but most improbable) U2 setlist. 27 songs as per Jorge. Out of Control for The Electric Co.